One of the many different consequences if a serious incident, such as a fatality at work, was to occur would be financial. Employers can be liable to pay blood money (Diya) in addition to statutory compensation under the United Arab Emirate (UAE) law. Currently equivalent to 24 months’ basic salary at the time of death subject to a cap and/or civil compensatory damages. It has been established that one of the major root causes of workplace injuries, illnesses, and incidents is the failure to identify or recognize hazards that are present, or that could have been anticipated. We need to be very aware of this because for every work activity and process there is an associated and unique, risk and hazard. Identifying these anomalies is the very first step in establishing a safe work place. Hazard is defined as anything that has the potential to cause harm. This could be any situation, substance, activity, event, or environment that could cause injury, ill health or death to a worker or other people in the workplace. As a health, safety and environmental professional in UAE, it is your responsibility to decide what could harm employees in the workplace as well as put in the necessary precautions to stop it. This is where being proactive comes in, taking action to control a situation rather than just responding to it after it has happened. A critical element of any effective health and safety program is a proactive, ongoing process to identify and assess such hazards. Identifying hazards is regarded as one of the most important aspects of any risk assessment in health and safety consultancy services. As it leads to the controlling of hazards and management of health and safety legislation. The collection and review of information on the hazards present in the workplace or likely to be present in the workplace. From equipment or machinery operating manuals, safety data sheets (SDS), self-inspection reports, audit findings, records of previous injuries and accidents etc. Conducting the initial review as well as periodic inspections of the entire workplace to identify new or recurring hazards through the use of a checklist, containing a typical list of hazards that is based on different categories such as; general housekeeping, slips, trips and falls, electrical equipment operations, work practices, work process flow etc. Proper and prompt investigation of injuries, illnesses, incidents, and near misses to determine the underlying hazards, their causes (both surface and root), and shortcomings in the organizational health and safety program. Grouping of similar incidents based on statistics and identifying the trends in injuries, illnesses, and reported hazards. Investigating these reports to provide a clearer indication of hazards in existence and aids in identifying hazards with the potential to cause future harm. Consideration of hazards associated with emergency and non-routine situations. Determination of the severity and likelihood of incidents that could result from each hazard identified, utilizing this information by prioritizing corrective actions. This is key to developing an interim control and in prioritizing permanent control hazards. In summary “a workplace is any place a worker carries out any work related task”, so check that even when workers are offsite or traveling on business, they are not exposed to health and safety risks. 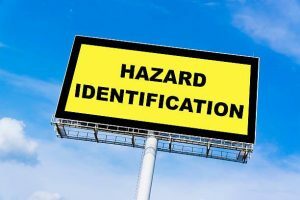 Another key thing to remember is that hazard identification should be a proactive process in itself; identifying potential hazards in order to eliminate or reduce the risk of injury/illness to workers, damage to property, equipment and the environment. After the hazards have been identified it is then essential that immediately the Health and Safety professional/consultant also develops an action plan in order to eliminate or control the hazards.